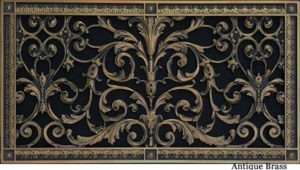 This Louis XIV style decorative grille can be used to cover a 12″ x 24″ heating and air conditioning duct as either a supply grille or a return air register. In addition it can be used as a speaker grille, foundation vent cover, return air filter grille or radiator cover. Availability: This item is made to order. Please allow 1-2 weeks. Covers Duct Size: 4" x 10" Frame Size: 6" x 12" Thickness: 3/8"Frame Width: 1-5/16"
Availability: This item is made to order. Please allow 1-2 weeks. Covers Duct Size: 14" x 20" Frame Size: 16" x 22" Thickness: 3/8"Frame Width: 1-5/16"
Availability: This item is made to order. Please allow 1-2 weeks. Covers Duct Size: 8" x 8" Frame Size: 10" x 10" Thickness: 3/8"Frame Width: 1-5/16"
Availability: This item is made to order. Please allow 1-2 weeks. Covers Duct Size: 8" x 10" Frame Size: 10" x 12" Thickness: 3/8"Frame Width: 1-5/16"
Availability: This item is made to order. Please allow 1-2 weeks. Covers Duct Size: 6" x 24" Frame Size: 8" x 26" Thickness: 3/8"Frame Width: 1-5/16"
Availability: This item is made to order. Please allow 1-2 weeks. Covers Duct Size: 16" x 16" Frame Size: 18" x 18" Thickness: 3/8"Frame Width: 1-5/16"